By Scott Gilfoid: Promoter Barry McGuigan isn’t saying whether Josh ‘The Tartan Tornado’ Taylor (13-0, 11 KOs) will enter the World Boxing Super Series (WBSS) light welterweight tournament to compete against talents like interim WBC light welterweight champion Regis Prograis (21-0, 18 KOs) after the way he had to struggle to beat 34-year-old former WBC 140 lb. champion Viktor ‘The Iceman’ Postol (29-2, 13 KOs) by a 12 round unanimous decision last Saturday night at The SSE Hydro in Glasgow, Scotland. McGuigan says Taylor, 27, is keeping his options open by not making a decision yet on whether he’ll enter the WBSS tournament or instead choose to try and face WBC light welterweight champion Jose Carlos Ramirez (22-0, 16 KOs). Taylor could always enter the WBSS tourney and compete with Prograis, WBA champion Kiryl Relikh and Ivan Baranchyk. 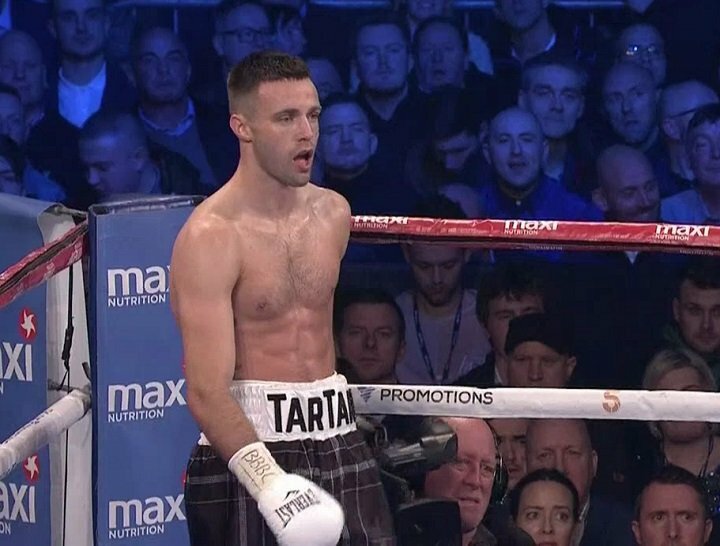 The positive of Josh Taylor competing in the WBSS tournament is the possibility of him winning the tournament and winding up with the IBF and WBA 140lb titles. If Taylor win those belts, he’d be in great shape once the tournament ends when he faces WBC champion Jose Ramirez. It would be a huge gamble on Taylor’s part though for him to fight in the tournament, as he doesn’t appear to be anywhere near as talented as Prograis. That’s a match-up that could go very, very wrong for Taylor with him getting knocked out in two or three rounds. Prograis appears to be world’s better than Tayor, who looked horrible in struggling to beat a past his best Viktor Postol last Saturday night. Taylor appeared to barely win the fight, but the judges gave lopsided 12 round unanimous decision that the boxing world totally disagreed with. The fans didn’t disagree with Taylor deserving the victory. Their issue was merely with the ridiculously lopsided scores of 117-110, 118-110 and 119-109. In other words, two of the judges scored it for Taylor 11 rounds to 1 and 10 rounds to 2. If you saw the fight, you would be sickened by how poor those scores were. Granted, Taylor won but it was by a razor thin margin. The judges were off in outer space with the three scores they turned in for that fight. When you see score like that in a close contest like the Taylor vs. Postol fight, it just makes you shake your head with disgust. Just reading what the 27-year-old Taylor is saying, I think it’s academic that he’ll be facing Ramirez next instead of showing bravery by entering the World Boxing Super Series tournament to risk his backside against Prograis, Relikh and Baranchyk. wasn’t lost on Top Rank boss Bob Arum. He clearly is aware of how horrible those scores were, and he’s not going to want to mar his fighter Ramirez’s record by having him fight in Scotland and wind up receiving the same treatment the 5’11” Postol did. Losing by a controversial decision isn’t on the top of Ramirez’s agenda for a fight against Taylor. If Taylor’s people want to try and lure a champion to the Scotland, they’re probably going to need to look in another direction towards someone like WBA belt holder Kiryl Relikh. “It was a little bit of a below-par performance,” Taylor said about how he performed against the Ukrainian talent Postol. ”I started very poorly in terms of defence and switched off too much. But I adapted and I definitely think there I can be 20 or 30 per cent sharper. I happy enough, though, and the next one will be the big one,” Taylor said. If the “next one will be the big one,” as Taylor is talking about, then it’s academic that he plans on having his promoters match him against Ramirez rather than risking his unbeaten record – and career – by entering the World Boxing Super Series tournament and winding up getting knocked out in three or four rounds by Regis Prograis. There are levels to the sport, and Prograis is way up there at the top of the division looking down at all the other guys like Taylor, Relikh, Baranchyk and Ramirez. It’s still not a given that Taylor will fight Ramirez next in the UK. The only way I see that fight happening in the UK is if Taylor’s management drag their feet during negotiations and let the fight go to a purse bid, hoping that they can outbid Ramirez’s promoters at Top Rank. I don’t know if they’ll be able to do that. If Top Rank boss Arum doesn’t want to put Ramirez in the position of potentially getting the same treatment Postol did, then he’ll likely win the purse bid by throwing down a large offer. But Arum might have enough confidence in Ramirez’s ability to knockout Taylor that he’ll be willing to risk him losing the fight by letting him fight in Glasgow in front of his legions of boxing fans. To be sure, the 5’10” Ramirez has excellent size, power and a very high work rate. If he’s able to get in a war against Taylor, he could very well KO him like he’s done against most of his opponents since he first turned pro 2012. Ramirez didn’t look so great in his last fight in defeating Amir Imam by a 12 round unanimous decision to win the vacant WBC light welterweight title last March at Madison Square Garden in New York. That fight was a lot closer than the scores handed down by two of the judges. The only judge that seemed to have his thinking cap on was the one that scored it 115-113 for Ramirez. It was that close of a fight. That fight showed that Ramirez is definitely, which you can argue is why Taylor is so excited about fighting him. He sees weakness in Ramirez, so he wants to fight him. If Taylor thought he could win the WBSS tournament, he’d likely enter that tournament in a second, because he’s emerge with two belts rather than one and his popularity would be sky-high because it would have meant that he beat the like of Prograis, Relikh and Baranchyk. Ramirez isn’t rated nearly as high as Prograis by the boxing world. Ramirez will be defending his WBC title next month against bottom #15 WBC fringe contender Danny O’Connor (30-3, 11 KOs) in a voluntary defense on July 7 on ESPN at the Save Mart Arena in Fresno, California. Ramirez has the victory in the bag by fighting the 33-year-old O’Connor, who hasn’t fought any of the talented contenders in the light welterweight division during his career. This is a safe fight for Ramirez. Prograis wanted to face Ramirez next, but he wouldn’t have had time to beat him, which he likely would have done with ease, and then enter the WBSS tournament. As such, Prograis opted to enter the WBSS tournament instead so that he could wind two world titles and then come out and look to beat Ramirez or Taylor to win the third title. There’s nobody in the light welterweight division that has the talent to challenge Prograis now that Terence Crawford has moved up to welterweight. Prograis is going to come out of the WBSS tournament as the king of the 140 lb. division.